In the first week of May, I visited my closest friend Tati in Syracuse. When I’m with Tati we go on adventures and I have the opportunity to try new daring things I would otherwise pass up. This May I went jogging in six feet of water for the first time. I didn’t know what water jogging was or that it meant going to the deepest part of the pool until we arrived at the YMCA. Excited to do something different, I tagged along thinking I would be in a pool that was at least four feet because all of my experience with pools consisted of small blow-up kiddie pools. I got this, right? Not at all. At least not at first. When I walked down the pool steps into the chlorine filled abyss of horror, the water made my legs wobbly but my flotation belt (which helps with the water jogging) helped me stand straight. Instant fear struck and I became paralyzed. I never felt this type of fear before. Tati looked at me concerned because she didn’t know this was my first time in an adult pool. After learning how I afraid I was, she quickly grabbed a small kickboard to help me float. I watched as two young girls, unafraid, swam with confidence and joy. I wish I had the confidence of a child. I felt terrified at first, but after a few moments of Tati explaining to me of my safety I floated to the edge of the pool and began to float along to the deep side. Five feet…then six feet. She explained to me that our bodies will always float but I have to take control of my movements. 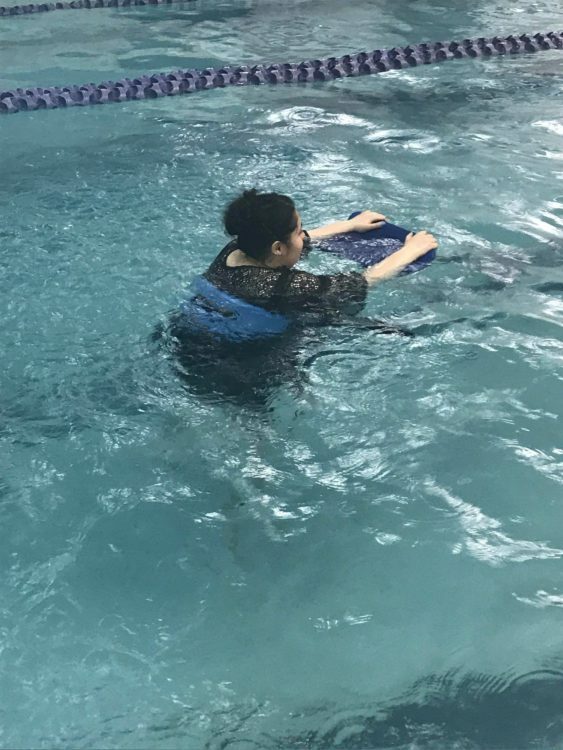 I used my strength to maneuver my body and muscles into more comfortable positions which meant focusing while I was floating. “When you panic your body tenses and you lose that control,” she said. Water jogging is harder then it looks. It helped to straighten my legs in order to trust that my control of myself will keep me afloat. The more she talked to me the more I began to understand my fear and was able to control my body. I needed to trust the water and trust myself. I WILL ALWAYS FLOAT. As my lesson continued and with Tati’s voice to guide me, I finally got the right rhythm to water jog. My first time in an adult pool and I learned so much! How does this relate to my anxiety? An uncontrolled situation fuels my anxiety. My mind escalates situations even before I can decide in what ways I have control and what ways I don’t. The water became my uncontrolled variable. While in the water, I found myself panicking because the water resistance did not allow me to comfortably stand straight or control my immediate movements. In order to stay upright, I needed to focus. I learned to stay calm and remember I will always float and control what I do. Fighting back the water resistance allowed me to use my abilities and strength to build focus and confidence. Control in water means I’m able to move my body, stay straight, move my arms in ways that helped my head stay above the water. I controlled myself even though there wasn’t immediate support around me. Just me and the water. The moment I felt overwhelmed my body would float in a plank position until I straightened myself and rid my mind of my own anxiety. I have control because at that moment I realized I’m always in control one way or another. I will always float and I will be okay. Focusing allows my mind to become relaxed. As I trust my element, my situation, and circumstance I will be in control of confidence and calmness. Six feet of water taught me that calmness and focus is what keeps me floating above the water. I will not drown, I will learn to swim. My anxiety will not fool me into believing I do not have control of myself.